The British boss of a Fifa partner firm being investigated over alleged illegal World Cup ticket sales has surrendered to a judge in Brazil. 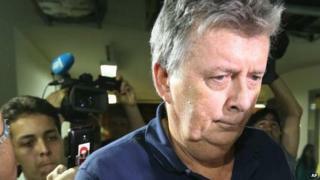 Police had tried to arrest Ray Whelan four days ago but he was not at his exclusive Rio de Janeiro hotel. Mr Whelan, director of Match Hospitality, denies any wrongdoing. An international gang is suspected of acting at as many as four World Cups, earning about $90m (£52m) per tournament. The gang is believed to have made money by acquiring and illegally selling on VIP tickets and hospitality packages. Match held the rights to sell hospitality tickets for the World Cup. Mr Whelan turned himself in to judge Rosita Maria de Oliveira Netto. He has been rearrested by police and is expected to be taken to a detention facility. According to a spokesperson for Mr Whelan's lawyer, Fernando Fernandes, Mr Whelan said: "I can finally start my criminal defence." Mr Whelan has been indicted with 11 other people. He was briefly arrested on 7 July but was released after questioning. Then last Thursday, police said they went to Mr Whelan's room in Rio's Copacabana Palace hotel but he was no longer there and they were told he had left an hour earlier. In a statement, Match said Mr Whelan had simply left the hotel with Mr Fernandes before police arrived. It said: "We do not believe that the term 'fugitive' is appropriate under the circumstances as he is presently with his lawyer." Hundreds of tickets and large amounts of cash have been recovered during the police operation, which gathered evidence via phone taps. Based in Zurich and in Cheadle, Cheshire, Match Hospitality describes itself as "the professional services company appointed by Fifa to provide ticketing, accommodation and event information technology services to Fifa". Its packages for games at Brazil 2014 ranged from $700 (£410) up to more than $100,000. Of some roughly 3 million tickets available at the 2014 event, it was given about 450,000 to sell to hospitality clients. World Cup 2014: Who are Fifa ticket agents Match Hospitality?